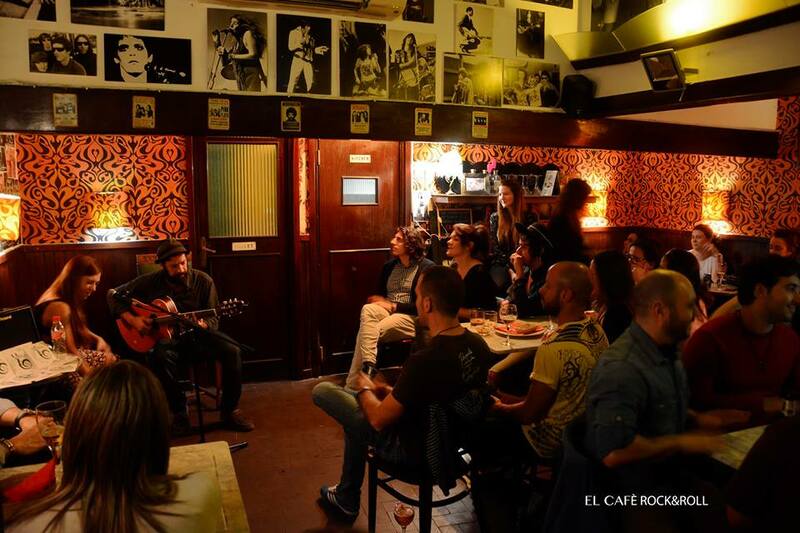 Check out our list of bars in the Center of town and also the Born, Gotico and Raval areas. Ex-pats and tourists alike will find our Pub, Real Ale and English Speaking lists useful. If you're looking to venture further afield and find a more authentic Barna drinking experience, then Gracia is the place to head for. For a brief description of all the "barrios" that we cover there's the list of Areas. Finally, check out the list of bars that we think are cool with our Top-10 selection, and our Clubs list if you're looking for places to boogie the night away! Check the menu at the top of every page and the tag cloud on the right for useful links to find what you need. Looking for 2nd hand english books? 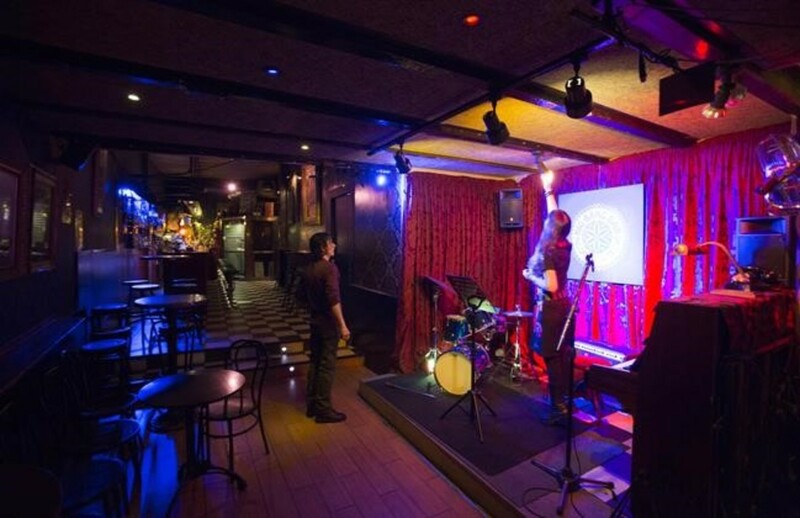 drinkBarcelona's PDF Bar Guides can be downloaded to your laptop or smartphone. You can print them out or use them offline - no wifi or data plan required. They still contain all the links from the reviews, so if you are online you can click through and get the latest info! Click to see all bars on Google Maps. 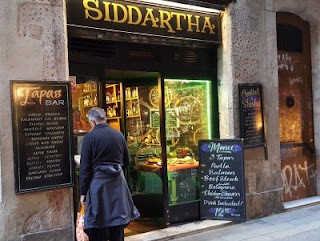 A great bar, with a great name - nestled in the darker depths of the city's Raval neighbourhood. Despite its name this isn't a place for old geezers looking for some hot grannies to boogie with, but a bar that places its musical emphasis on the 50's and 60's. This place has a great ambience: mixed between those who wanna rhythmically swing their hips at an attempt at some kind of sexual signalling to those who just want to drink, chat and soak up the down-to-earth yet low voltage electric atmosphere that oozes through the masonry of this rather unusual place. You could do much worse than spend an evening here with friends, peers or anyone else that you manage to procure during your drunken wanderings! 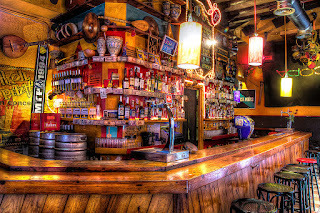 A bar for real people who like some 'old-school' spiciness mixed in to a good evening's imbibing! Oh, and by the way there is no entrance fee. Update 2018 - Thu & Sun is Open Mic style live music plus Fri & Sat live jazz - would definitely recommend a visit, but bear in mind that the place is small and crowded. Check their Facebook for details of upcoming live music. 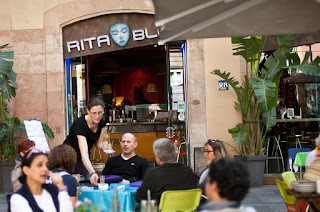 Rita Blue is a modernist themed bar in a small open plaça just off the Ramblas. As such it's a perfect spot to chill out from the tourist rush during the day, and a good bar & restaurant experience in the evening. The interior has a retro feel that includes 50's-style lamps and lanterns hanging from the ceilings. The front of the establishment has a curved bar with plenty of funky shaped stools along it and the glass front that overlooks the plaça with adjoining church. In addition, there's a small comfy sofas area in one corner, and behind the bar is the rather compact restaurant seating area. There's a dark basement dance floor complete with disco balls that gets crowded later on for live acts during the week and house and techno sets on weekends. There are plenty of tables available on the terrace in the square, however these are very popular and the outside service can suffer when the place gets busy. Food is pretty good Mexican and Mediterranean fare and the great drinks, especially cocktails, will get you grooving. Rita Blue is one of those bars that just has a really good vibe, and this is helped by friendly staff, many of whom speak good English. It attracts a fairly young crowd and so has a studenty, artsy, friendly atmosphere that is very endearing. This place is very popular with locals and tourists alike, and so it pays to get there earlier rather than later if you want to get a seat. All in all, Rita Blue is one of the better modern bars in the center of town, and well worth a visit. 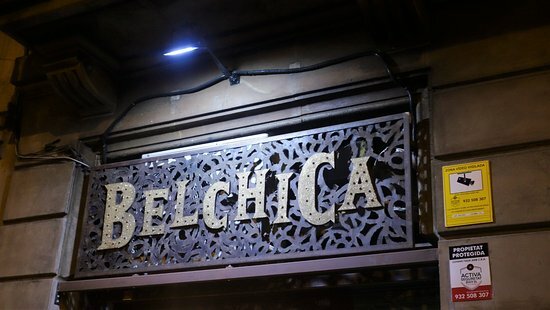 A bar that is for those who like low lighting, chandeliers, good Asian food and excellent cocktails! Siddartha is really a fusion of bar and restaurant but the distinction doesn't make it a place you can't pop into without having to fulfil any gastronomic expectations. One thing I particularly liked was the lower parts of this abode which has candle lit wooden tables and makes you feel like you're somewhere a little bit unique and special. Whilst there we sampled the house-made cocktails and I have to admit that they were rather good. Music wise, this place has nothing special beyond an erratic mix of 'world music' but this is completely in-tune with the ambiance of this place. Prices were not particularly cheap here but you're paying for the atmosphere and uniqueness of your surroundings and like all good things in life, you get what you pay for. This is not a bar to go in for a heavy drinking session with the 'lads' but a good place to go for a chat, some strong drinks and an interesting somewhat 'East meets West' experience! 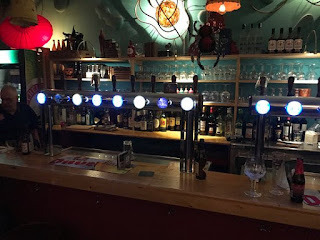 Update 2018 - Well, seems from our comments that Siddartha is a place for ambiance & cocktails only - don't try the food! Other reviews online seem to suggest that main dishes and service can be somewhat hit & miss, so Siddartha is maybe best saved for a single stop whilst bar hopping in the center of town. A nice Belgian bar with a very large choice of beers. Apparently, Barcelona's first and only Belgian bar. This is a friendly place where you may encounter many French speakers from Belgium, as this is their local hangout. 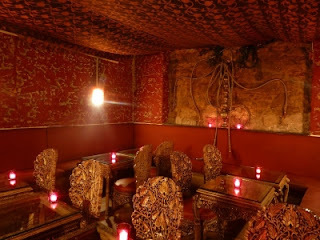 Quiet during weekdays, even with their Happy Hour from 6pm to 8pm, but nice ambiance at the weekend. There are regular DJ sessions, a large screen TV for big football games and a photo / art exposition that changes regularly. The places is usually buzzing with a good mix of Europeans, sampling over 40 top quality Belgian beers with Stella, Leffe and Hoegaarden on tap. For ex-pats, the barmen speak English and French, and and you can drink it in a relaxed, slightly sports bar like atmosphere with original colours and decoration. 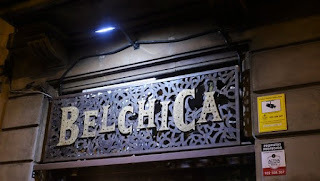 Update 2018 - If you're looking for a real ale bar that's walking distance from Plaza Universitat, then Belchica is a good choice. The surrounding blocks have several alternatives for real ale aficionados, including the BrewDog (C/ Casanova 69) & BierCaB (C/ Muntaner 55) bars. 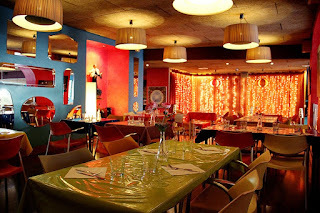 Following the arty vibes of Poble Sec, this fab and funky bar assaults the senses with a spectrum of colours and a sprinkling of all that is Latin American. 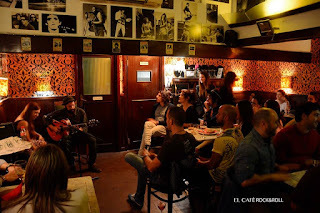 One of the hugest bars I know - not just in Poble Sec but in all of our fine city, this is a bar for those who appreciate everything from secluded nooks & crannies, romanticising a betrothed, to guys like me who like space to stretch my weary legs. With the initial bar area meandering into a second back room for plays, salsa dances and private parties, this bar offers large doses of potentially dangerous quantities of fun! Cocktails are also a speciality here and although some might call the décor a little gaudy, others might say its bright and cheerful - kind of like a rainbow that got shredded in the washing machine. A highly recommended experience. Update 2018 - La Tinta Roja is a bar that's also a theatre and a tango club and event space. 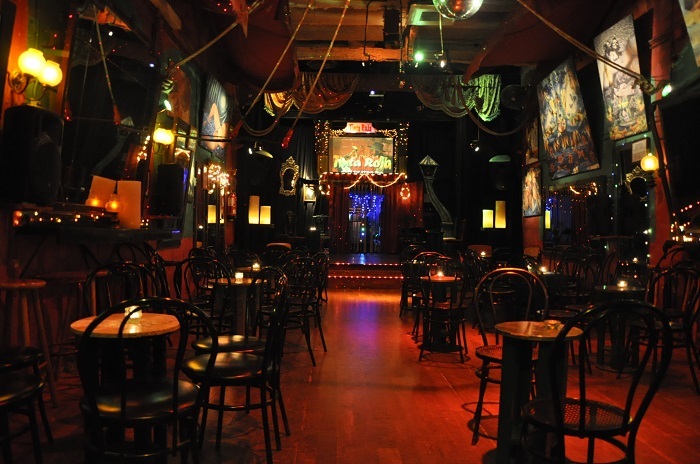 They have theatre nights, workshops, dancing and other activities, as well as being a cool bar to chill out. 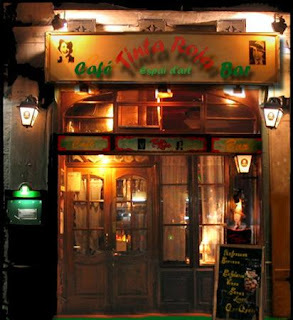 Check Tinta Roja's website for opening hours as they can change for summertime, and for a list of upcoming events. 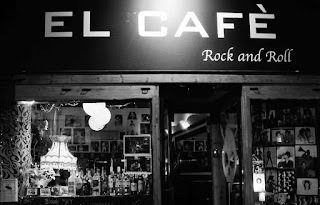 This is a surprisingly nice, funky bar amidst the plethora of bars in this happening street in Gracia. Surprising in the sense that there's something for everyone and although not comparable to the hipper local cocktail bars such as La Fourmi et al, it does hit the spot just right. Prices are cheap, including the usual range of cocktails, the food menu is nice and eclectic and the music and ambience better than you'd think when peeping in from the street! Expect this abode to get busy around midnight as couples, groups and bar stool dwellers start to drift in, in search of a little hedonism to spice up their (one presumes), otherwise typical daily grind fest. 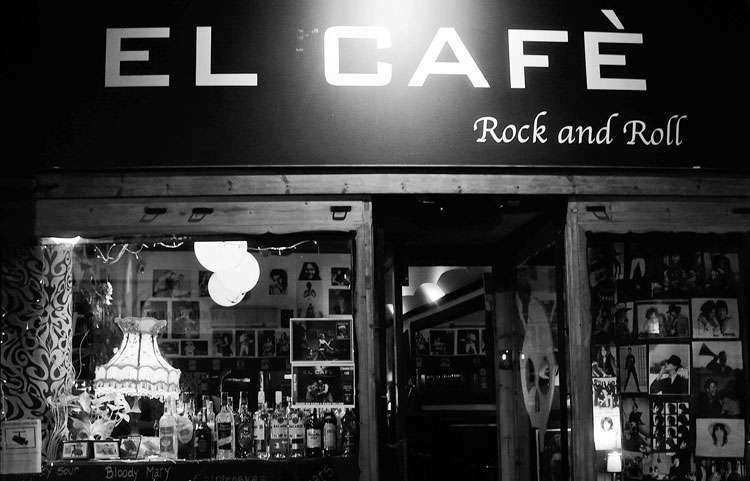 Update 2018 - Check El Cafe's facebook page for details of weekend live music gigs. 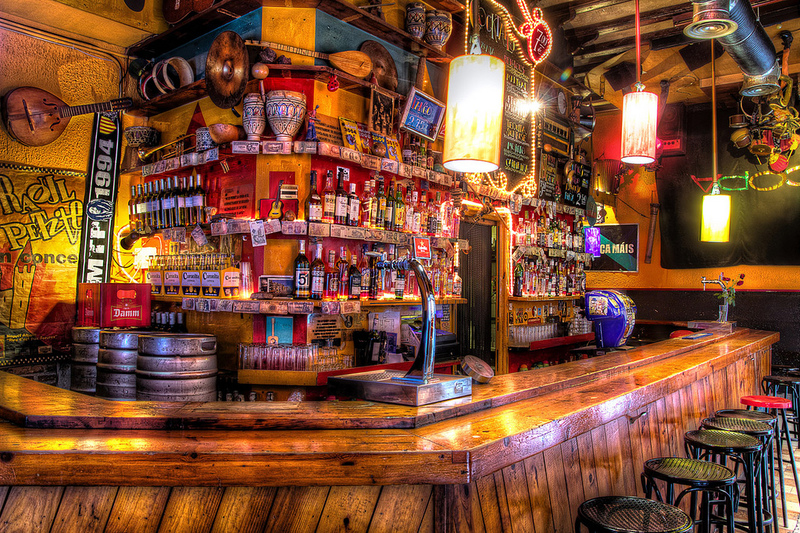 This bar was opened by the local well known musician, Manu Chao. This quite possible explains two things about this abode. One, it is eclectic - it has musical instruments on the walls and ceilings (which are usable with permission from the bar staff) and two, it's very down-to-earth bohemian! 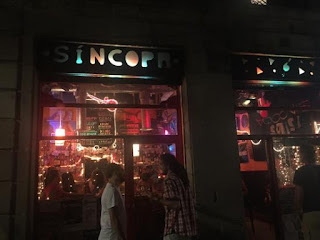 Assaulting you with a lively and loud ambience, this is a great place to go and liven up your night if you're wandering around the shady streets of the Goticó. Despite the obvious presence of drug dealers, prostitutes and other 'entrepreneurs of the night' this area oozes with character and is in fact not as dangerous as it seems. Although I can't give any overwhelming reason to visit this bar, if you are in the city centre and fancy somewhere with a little more 'joie de vivre', you could do worse than dropping in here. If you do pop in for a drink or three and it's 'not your cup of tea', at least you can say you've been to Manu Chao's drinking den (and you might just get a chance to see him)! Update 2018 - Still going strong, this reggae bohemian bar is a good choice if you're deep in the Goticó barrio.